36,000 euros for an aureus of Philip I, 50,000 euros for an aureus of Hostilian, and 65,000 euros for a solidus of Glycerius; these prices evidence that Roman gold is again good for records. The other results of Gorny & Mosch sale 228 to 230 are nothing to sneeze at, either. Between 9 and 12 March 2015, Gorny & Mosch conducted its auction week, right after the Numismata. The catalogues featured a large offer with coins dating from Ancient to Modern Times. Several collections were for sale, including a large series of coins of the Roman Republic and a type collection of French coins starting with the French Revolution. SICULO-PUNIANS (Sicily). Tetradrachm, 320-310. Acquired from Ratto in 1945. Marvelous style! About extremely fine. Estimate: 12,000,- euros. Hammer price: 24,000,- euros. 12,000 euros had been the estimate of the cover piece of Gorny & Mosch Auction 228. It was a magnificent tetradrachm of the Siculo-Punians, attractively toned, of superb style and an impressive provenance. The result was likewise impressive. The coin changed hands for 24,000 euros. Only half that amount, but still 12,000 euros on an estimate of 7,000 euros, was the price a rare gold drachm from Karystos obtained, showing the bearded head of Heracles on the obverse and the lying cow on the reverse. The various specimens from the series of Athenian coins attracted much interest as well. The “wappenmünzen” brought the highest results in this category: 26,000 euros was the hammer price of a didrachm with the wheel while the didrachm with the gorgoneion achieved 22,000 euros. Both had been estimated at 10,000 euros. 14,000 euros was what the first Archaic owl of this series realized, 16,000 euros were obtained by the specimen with the attractive helmet’s crest, fully displayed on the planchet, while another tetradrachm graded extremely fine with the most wonderful Archaic smile of Athena brought 12,000 euros. Lot 120: ATHENS (Attica). Tetradrachm, c. 400-380. Extremely rare. Extremely fine. Estimate: 2,500,- euros. Hammer price: 6,500,- euros. Of high numismatic interest was the late Classical tetradrachm with a mint mark showing a bull’s head which might well indicate that this coin had been produced in Western Asia Minor or the Levant. It carried an estimate of 2,500 euros, to obtain a hammer price of 6,500 euros in the end. Coins of the Roman Republic are not rare as such. Yet there are always rarities hidden in this category whose rarity can only be recognized by the connoisseur. This is illustrated by the silver sestertius from the truly vast series that L. Calpurnius Piso Frugi had struck around 90 B. C., depicting the head of Apollo on the obverse and the rider pacing right on the reverse. The coin had carried an estimate of 2,500 euros. Yet the hammer went down only as late as 11,000 euros. Considering how rare sestertii from this time are this result is high but still reasonable. When it comes to Roman Republican coins rarity is perhaps not even as important as beauty. The denarius of C. Publicius from 80 B. C., for instance, with Hercules strangling the Nemean Lion on the reverse usually sells at a the three-digit figure. But when – like in this case – the specimen in question is extremely fine, fully struck, magnificently centered, with a fabulous patina, then the hammer price might well be as high as 3,000 euros. The same happened to a denarius of Papius with the jumping griffin. It owed its result, 1,600 euros, entirely to its beauty. Lot 727: GLYCERIUS, 473-474. Solidus, Ravenna. Extremely rare. About extremely fine. Estimate: 30,000,- euros. Hammer price: 65,000 euros. There is no need for explaining the hammer prices of Roman gold. It only takes a list to prove the trend that Roman and Byzantine gold coins are more than popular with collectors these days: Tiberius, brilliant uncirculated, estimate: 5,000 euros, hammer price: 13,000 euros; Lucius Verus, brilliant uncirculated, estimate: 10,000 euros, hammer price: 30,000 euros; Caracalla, extremely fine, estimate: 5,000 euros, hammer price: 19,000 euros; Philippus Arabs, extremely fine, estimate: 25,000 euros, hammer price: 36,000 euros; Hostilian, good extremely fine, estimate: 25,000 euros, hammer price: 50,000 euros; Glycerius, about extremely fine, estimate: 30,000 euros, hammer price: 65,000 euros; Michael II, good extremely fine, estimate: 14,000 euros, hammer price: 22,000 euros. Lot 199: ARTAVASDES III, 5-2 B. C. (or Artavasdes IV, A. D. 4-6) (Armenia). Probably the only specimen in private possession. Very fine. Estimate: 17,000,- euros. Hammer price: 18,000 euros. It is tradition that the second day of each Gorny & Mosch auction is devoted to the coins that are intended for collectors who have to keep an eye on their budget. Yet everybody knows that there is also much material available that is of interest to keen special collectors. Not everyone could have afforded, for example, the rare drachm of the Armenian ruler Artavasdes III sold in auction 228 for 18,000 euros featuring the portraits of himself and the Roman emperor Augustus. Most collectors of Armenia, though, found something in the second auction sale, when 15 Armenian coins were being called up. The prices ranged from 120 to 800 euros. The total estimate of 2,750 euros was markedly exceeded by the hammer price adding up to 5,410 euros. Admittedly, that is not as spectacular as the prices the Roman gold obtained, but that surely did not dampen the joy the proud new owners experienced. Lot 1810: GALLIENUS, 260-268. Antoninianus, 260-261. Legionary coinage for LEG IX. Very fine. Estimate: 120,- euros. Hammer price: 700,- euros. Those interested in the 3rd century A. D. were particularly likely to find something to their taste. Let us have a look at two interesting specimens in this respect: a legionary coin of Gallienus with the wild boar on the reverse that had carried an estimate of 120 euros but was auctioned off for 700 euros and a quinarius of Probus on his victory over the Germans realizing 2,000 euros on a pre-sale estimate of 1,500 euros. 570,000 euros, that had been the total estimate of auction 230, and 875,000 euros was the hammer price in the end. The offer included many exciting specimens that were reasonably estimated, which was appreciated by a great number of customers. The many mining thaler found an audience that was interested and eager to bid. All items were sold, most of them surpassing their estimate by far. Special mention deserve the mining thaler 1684 HB of Ernest Augustus of Brunswick-Calenberg (1,200 / 4,600 euros), the mining thaler 1720 HCB of George I Louis of Brunswick (750 / 2,400 euros), and the mining medal 1847 of Frederick Augustus II of Saxony on the yields of the Himmelfahrt samt Abraham zu Freiberg Mine (1,000 / 2,600 euros). Lot 3229: SILESIA. Gold patenpfennig 1704, unsigned. Extremely fine to brilliant uncirculated. Estimate: 350,- euros. Hammer price: 1,800,- euros. It is of course always interesting to see how unerringly collectors pick out the really rare pieces. An extremely rare ½ vereinsthaler from 1572, issued by Louis IV of Marburg, rose from its estimate of 500 euros to 3,600 euros, an unsigned Silesian patenpfennig from 1704 started at 350 euros to arrive at 1,800 euros in the end. Lot 3347: MEDALS. Medal 1565, signed R (Lukas Richter). Auction Lanz 33 (1985), 66. Rare. Very fine. Estimate: 500,- euros. Hammer price: 2,200,- euros. In the light of the artistic skills deployed in the production of the 16th century German medals, the estimates of the ones on offer, under lots 3342 to 3349, have actually been a bit too modest, although the prices they obtained were not that bad. 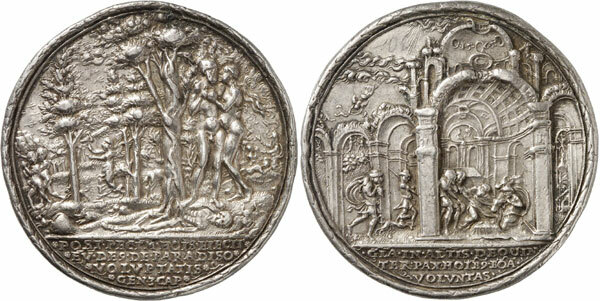 A very fine medal by Lukas Richter from 1565, to name only one example, depicting the fall of man on the one side and the nativity of Jesus as the beginning of the redemption on the other, did not realize its estimate of 500 euros but obtained as much as 2,200 euros. The coins and medals from Medieval and Modern Times were highlighted by a type collection of French coins starting with the French Revolution, with numerous medals and another series of coins from the French colonies. Let us not look for record prices there! It is enough to know that there are so many collectors in Germany interested in that field that just 16 lots were left unsold, out of the total number of almost 200. The total estimate had been 45,000 euros but the hammer price added up to 67,000 euros which certainly is an impressive result. The surprise of the auction was a bronze medal with the portrait of William II of Montferrat, 1494-1518, which started at 100 euros, only to arrive at 2,400 euros in the end. Almost as big was the rise of a medal from 1580, bearing the coat of arms of William Scheuhenstuel of Weyching and his wife Frau Lucia Zandegger. It had likewise carried an estimate of 100 euros and was auctioned off for 2,000 euros. The fact that a careful examination of Gorny & Mosch’s multiple lots always pays off was proven by lot 3925. The estimate for the 118 items in all possible grades had been 50 euros. The bidding fight stopped at 1,000 euros. Apparently, two connoisseurs had discovered a big rarity there. Lot 4285: ISLAM / OTTOMAN EMPIRE. Abd al-Hamid I, 1187-1203 H. (1774-1789). 1 1/2 altin 1187 H. / year 7 (= 1773). Misr Mint. Ziynet coinage following the Istanbul model. Extremey rare. Holed, very fine. Estimate: 1,000,- euros. Hammer price: 10,000,- euros. 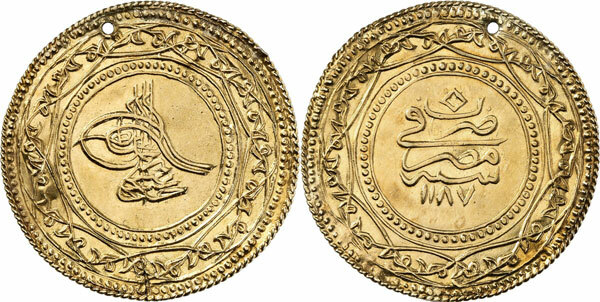 Next in line were the Islamic coins with a collection of Ottoman specimens. Numerous rarities were offered for sale and the customers clearly appreciated these. A very fine altin of Selim I from 1517, Misr Mint, for example, realized 4,200 euros (estimate: 1,000 euros), and an extremely rare Zinyet coinage following the Istanbul model struck in the Misr Mint triggered a fierce bidding fight and changed hands only for 10,000 euros (estimate: 1,000 euros). Lot 5234: RUSSIA. Alexander III, 1881-1894. Roubel 1889 AG, St. Petersburg. Very rare. Brilliant uncirculated. Estimate: 7,500,- euros. Hammer price: 26,000,- euros. The sale was concluded by an impressive collection of Russian coins. The prices realized bear witness to the fact that the roubel has significantly fallen in value against the euro. Mainly the coins and medals in the low and mid-range price segment have lost a number of buyers to the effect that the Russian coins and medals are relatively advantageously priced at the moment. When was the last time a bronze medal with the portrait of Peter I on the Battle of Poltava graded extremely fine to brilliant uncirculated was available for mere 300 euros? While so far every perfect coin and medal had turned out to be a bestseller, it has now become rather difficult to find an outlier. One possible exception is a rouble 1889 AG struck in the St. Petersburg Mint graded brilliant uncirculated that rose from 7,500 euros to 26,000 euros. The big rarities – as the Order of the White Eagle, for instance, – did not reach their estimate or were even left unsold, as the silver 5 kopeck piece 1860 SPB-FB from St. Petersburg. The next auction of ancient art is scheduled for 17 June 2015, and the next coin auction will be conducted between 5 and 9 October 2015. Consignments for the latter are welcomed until 28 July 2015. Please contact Gorny & Mosch, Giessener Münzhandlung, Maximiliansplatz 20, D-80333 Munich, phone +49 / (0)89 / 24 22 643-0, telefax +49 / (0)89 / 22 85 513. I have a Glycerius 473 A.D. coin my Grandpa left me that I am looking to sell. Any help is appreciated.